Blame it on the zombie movies. For years I’ve collected survival books and workedon what I like to call “Plan B”. Sure I thought this might be a tad unusual, or at least that I was in the minority, until I discovered Smiling at the Apocalypse on the blog Sweet Juniper. My people are out there. Frankly, I doubt that a few books will save my husband, the dog or myself (the dog has the best odds). But should we make it out of the city, avoiding major highways and sticking to back roads – yep, saw The Book of Eli over the weekend – at least we’ll be ready. Two books integral to my apocalyptic preparedness library are The Homesteader’s Handbook: A Guide to Independent Living by James E. Churchill and The Mother Earth News Almanac: A Guide Through The Seasons. Churchill was a contributor to The Mother Earth News (a back-to-the-land magazine started in the 1970’s and still in print today) and so, in many ways, these books complement each other. Amongst the pieces of information to be discovered in The Homesteader’s Handbook are instructions on how to do your own butchering, clean an old well and construct a latrine. Churchill discusses shelter options – whether it be recycling an old house or building your own (models include sod, log, stone, adobe or tepee). Every section comes complete with diagrams. And like all good hippies he provides detailed info on composting, beekeeping, organic gardening and growing/raising your own food (indoors or out). The Homesteader’s Handbook is much more narrative in style than The Mother Earth News Almanac – with lengthier and more in-depth chapters with names like The Water Story; Growing an Indoor Garden; Meat, Milk and Egg Producers and Preserving Foods. 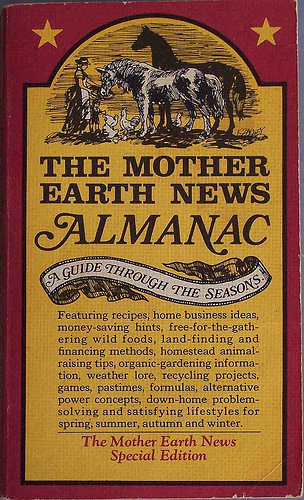 The Mother Earth News Almanac is a mishmash of information ranging from basic farming strategies to tips that Martha Stewart would be proud to feature in Good Things. (For example, storing twine in old gloves with the fingers clipped, making a v-notch weed cutter and storing fish hooks between two pieces of tape). It definitely has a folksy, Little House vibe to it – but that’s part of the charm. It’s packed with useful stuff for even the amateur gardener, such as supporting tomato plants, fast & easy composting, constructing a cold frame (for starting seedlings in winter) and growing a sprout garden. Whereas the Homesteader’s Handbook focuses on the logistics of dropping off the grid and surviving, The Homesteader’s Handbook focuses more on what to do in the day-to-day. 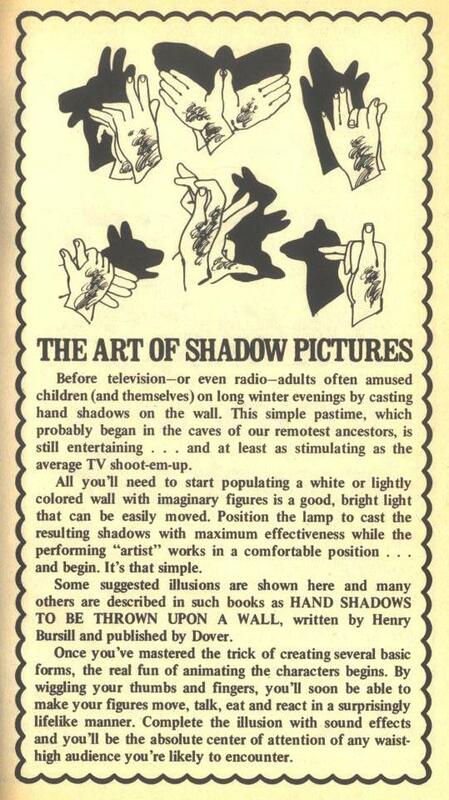 And, I’ll be honest, at times the day-to-day in a techno-free world is looking a little bleak. Novella Carpenter mentions referencing books very similar to these two when she began her Ghost Town Farm. So there’s no reason to fear that these books will gather dust prior to the Big Flash (or global zombie pandemic, meteor crash, adlib your disaster here _________ ). 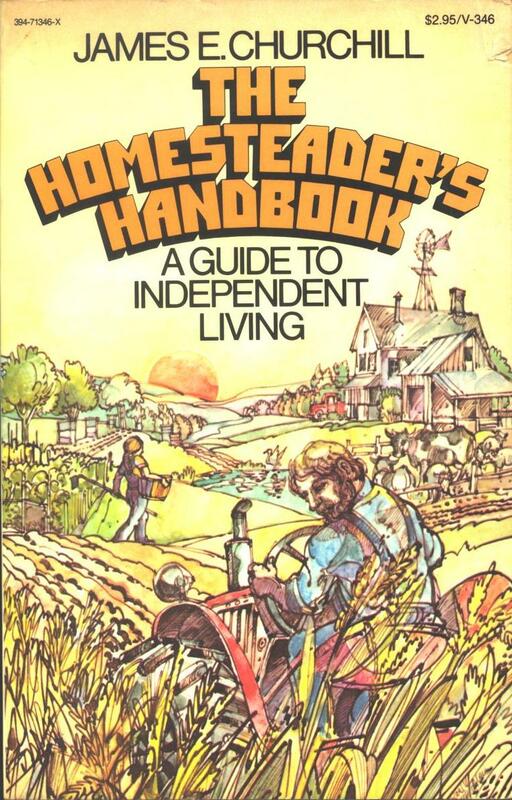 Close to 40 years after being published, The Homesteader’s Handbook and The Mother Earth News Almanac remain relevant for those who want to get in touch with their agrarian roots. Next postWhat Are You Reading on Mondays?